What festival does the Church celebrate today? The Catholic Church commemorates today the institution, by our Saviour, of the Holy Sacrifice of the Mass, and the Most Blessed Sacrament of the Altar. This commemoration she has celebrated from the first ages of Christianity. What remarkable things did Christ perform on this day? He ate with His apostles the Paschal lamb which was a type of Himself; it was eaten with bitter herbs and unleavened bread; they ate it standing with clothes girded, and staff in hand, in remembrance of the hurried escape of the Jews from Egypt. (Exod. XII.) After having eaten the Paschal lamb our Lord with profound humility washed the feet of His apostles, exhorting them to practise the same humility and charity; afterwards, He gave them His Flesh and Blood under the appearance of bread and wine, for spiritual food and drink, thus instituting the Must Holy Sacrament of the Altar, the Sacrifice of the Mass, and the priesthood; for when He said to the apostles: Do this in commemoration of me, he ordained them priests. After this He held His last discourse in which He particularly recommended brotherly love; said that beautiful, high-priestly prayer, in which He implored His Heavenly Father particularly for the unity of His Church. He then went as usual to Mount Olivet, where He commenced His passion with prayer and resignation to the will of His Father, suffering intense, deathlike agony, which was so great that He sweat blood. Here Judas betrayed Him into the hands of the Jews, by a treacherous kiss. They bound Him and led Him to the high-priests, Annas and Caiphas, where He was sentenced to death by the council, and denied by Peter. COLLECT O God! from whom Judas received the punishment of his sin, and the thief the reward of his confession: grant us the effects of Thy mercy; that as our Lord Jesus Christ at the time of His passion bestowed on each a different recompense of his merits, so having destroyed the old man in us, He may give us the grace of His Resurrection. Who liveth, & c.
What ceremonies are observed in this day's Mass? The crucifix is covered with a white veil in memory of the sacred institution of the Blessed Sacrament of the Altar. The priest comes to the altar robed in white vestments; the Gloria in excelsis is solemnly sung, accompanied by the ringing of bells, and all Christians are exhorted to render praise and gratitude to the Lord for having instituted the Blessed Feast of Love; after the Gloria the bells are silent until Holy Saturday to indicate the Church's mourning for the passion and death of Jesus; to urge us also to spend these days in silent sorrow, meditating on the sufferings of Christ, and in memory of the shameful flight of the apostles at the capture of their master, and their silence during these days. At the Mass the priest consecrates two hosts one of which He consumes at the Communion, and the other he preserves in the chalice for the following day, because no consecration takes place on Good Friday. The officiating priest does not give the usual kiss of peace before Communion, because on this day Judas betrayed his master with a kiss. After Mass, the consecrated host in the chalice, and the Blessed Sacrament in the tabernacle, are taken in procession to the sacristy or repository, in memory of the earliest times of Christianity, when the consecrated hosts for the communicants and the sick, were kept in a place especially prepared, because there was no tabernacle on the altar. Moreover it also signifies Christ's going to Mount Olivet, where His Godhead was concealed. After the procession the priests with the choir say vespers in adoration of the Blessed Sacrament. EPISTLE (I Cor. XI. 20-32.) Brethren, When you come together into one place, it is not now to eat the Lord's supper. For every one taketh before his supper to eat. And one indeed is hungry, and another is drunk. What! have you not houses to eat and drink in? Or despise ye the Church of God? and put them to shame that have not? What shall I say to you? Do I praise you? In this I praise you not. For I have received of the Lord that which also. I delivered to you: that the Lord Jesus, the same night in which he was betrayed, took bread, and giving thanks, broke it, and said: Take ye, and eat: this is my body, which shall be delivered for you: this do for the commemoration of me. In like manner also, the Chalice, after, he had supped, saying: This Chalice is the New Testament in my blood. This do ye, as often as you shall drink it, for the commemoration of me. For as often as you shall eat this bread, and drink this chalice, you shall show the death of the Lord, until he come. Wherefore, whoever shall eat this bread, or drink the chalice of the Lord unworthily, shall be guilty of the body and of the blood of the Lord. But let a man prove himself, and so let him eat of that bread, and drink of the chalice. For he that eateth and drinketh unworthily, eateth and drinketh judgment to himself, not discerning the body of the Lord. Therefore are there many infirm and weak among you, and many sleep. But if we would judge ourselves, we should not be judged. But whilst we are judged, we are chastised by the Lord, that we be not condemned with this world. EXPLANATION The early Christians were accustomed after the celebration of the Lord's Supper, to unite in a common repast; those who were able furnished the food, and rich and poor partook of it in common, in token of brotherly love. This repast they called "Agape,” “meal of love.” At Corinth this custom was abused, some ate before Communion that which had been brought, became intoxicated, and deprived the poor of their share. The Apostle condemns this abuse, declaring it an unworthy preparation for Communion, and reminds the Corinthians of the institution of the Blessed Sacrament telling them what a terrible sin it is to partake of the body and blood of the Lord unworthily, for whoever does this makes himself guilty of the body and blood of the Lord, and eats and drinks his own judgment, that is, eternal damnation. Therefore prove yourself, O Christian soul, as often as you communicate, see whether you have committed any grievous sin which you have not confessed, or for which you were not heartily sorry. GOSPEL (John XIII. 1-15.) Before the festival day of the Pasch, Jesus knowing that his hour was come, that he should pass out of this world to the Father: having loved, his own who were in the world, he loved them to the end. And when supper was done, the devil having now put into the heart of Judas, the son of Simon Iscariot, to betray him: knowing that the Father had given him all things into his hands, and that he came from God, and goeth to God: he riseth from supper, and layeth aside his garments: and having taken a towel, he girded himself. After that, he poureth water into a basin, and began to wash the feet of the disciples, and to wipe them with the towel, wherewith he was girt. He cometh therefore to Simon Peter, and Peter saith to him: Lord, dost thou wash my feet? Jesus answered, and said to him: What I do, thou knowest not now, but thou shaft know hereafter. Peter saith to him: Thou, shaft never wash my feet. Jesus answered him: If I wash thee, not, thou shaft have no part with me. Simon Peter with to him: Lord! not only my feet, but also my hands and my head. Jesus saith to him: He that is washed, needeth not but to wash his feet, but is clean wholly. And you are clean, but not all. For he knew who he was that would betray him: therefore he said: You are not all clean. Then after he had washed their feet, and taken his garments, being set down again, he said to them: Know you what I have done to you? You call me Master, and Lord: and you say well, for so I am. If then I, being your Lord and Master, have washed your feet, you also ought to wash one another's feet. For I have given you an example that as I have done to you so do you also. Why did Jesus wash the feet of His disciples? To give them a proof of His sincere love and great humility which they should imitate; to teach them that although free from sin, and not unworthy to receive His most holy body and blood, their feet needed cleansing, that is, that they should be purified from all evil inclinations which defile the heart, and prevent holy Communion from producing fruitful effects in the soul. Why is it that on this day in each church only one priest says Mass at which the others receive Communion? Because on this day Christ alone offered the unbloody Sacrifice, and having instituted the Blessed Sacrament, fed with His own hands His disciples with His flesh and blood, it is therefore proper that in commemoration of this, the priests in one church should receive the Blessed Sacrament from the hands of one, according to the example of the apostles, but as a sign of the priestly dignity which on this day Christ gave to the apostles and their successors, each priest wears a stole. Why art the altars stripped on this day? To show that Jesus took off, as it were, at the time of His passion, His divine glory, and yielded Himself up in utter humiliation into the hands of His enemies to be crucified, (Phil. II. 6. 7.) and that at the crucifixion He was forcibly stripped of His garments, which the soldiers divided among them, as foretold in the twenty-first psalm, which is therefore said during this ceremony. The faithful are urged to put off the old sinful man with his actions, and by humbling themselves become conformable to Christ. 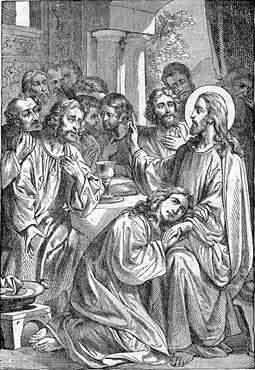 Why is it that spiritual superiors wash the feet of their subjects, as do also the Catholic princes the feet of twelve poor men? To commemorate the washing of the apostles' feet by Christ, and to teach all, even the highest to exercise the necessary virtues of humility and charity towards all, even the lowest, according to the example given by Jesus. Princes and spiritual superiors therefore kiss the feet after washing them, and the pope presses them to his breast, giving to each person a silver and a gold medal, on which is pictured the washing of the feet by Christ. What is Tenebrae, and what its meaning? Tenebrae means darkness, and represents the prayers formerly said in the dark hours of the morning. In the Tenebrae the Church mourns the passion and death of, Jesus, and urges her children to return to God; she therefore makes use of those mournful words of Jeremias: “Jerusalem! Jerusalem, be converted to the Lord, thy God!" Why is the Tenebrae said in the evening? In memory of that time when the early Christians spent the whole night preceding great festivals in prayer, but later, when zeal diminished, it was observed only by the clergy on the eves of such festivals; also in order that we may consider the darkness, lasting for three hours, at the crucifixion of Christ, whence the name Tenebrae; and lastly, to represent by it that mourning, of which darkness is the type. Why, during the Prayers of the clergy, are the lights in the triangular candlestick extinguished one after another? Because the Tenebrae, as has been already remarked, in the earliest times of the Church, were held in the night, the candles were extinguished one after another, as the daylight gradually approached they were no longer, necessary; again, at the time of the passion and death of Jesus, His apostles whom He calls the light of the world, one, after another gradually left Him; at the death of Christ the earth was covered with darkness. The Jews, blinded by pride, would not recognize Christ as the Saviour of the world, and therefore fell by His death into the deepest darkness of hardened infidelity. What is meant by the last candle which is carried lighted behind the altar, and after prayers are finished, is brought back again? This candle signifies Christ; who on the third day came forth from the grave, by His own power, as the true light of the world, though according to His human nature He died and lay in the grave until the third day. Why is a noise made with clappers at the end of the Tenebrae? This was formerly a sign that service was over; it, also signifies the earthquake which took place at Christ's death. How should we attend the Church service on this day? The Church commemorates on this day the institution of the Most Blessed Sacrament of the Altar; we should therefore consider with a lively faith that Jesus, our divine Teacher and Saviour, is really and truly here present; we should adore Him as the Son of God, who became man to redeem us; should admire the love which determined Him to institute the Blessed Sacrament, that He might always be with us; and should thank Him for all the inestimable graces which we derive from this Sacrament. REMARK In the Cathedrals the holy oils which are used in Baptism, Conformation, Holy Orders, and Extreme Unction, as also in consecrating baptismal fonts and altar stones, are blessed on this day. Let us thank our Lard for the institution of these Sacraments at which blessed oily are used.